11. "Cofizz: Follow your Idol". 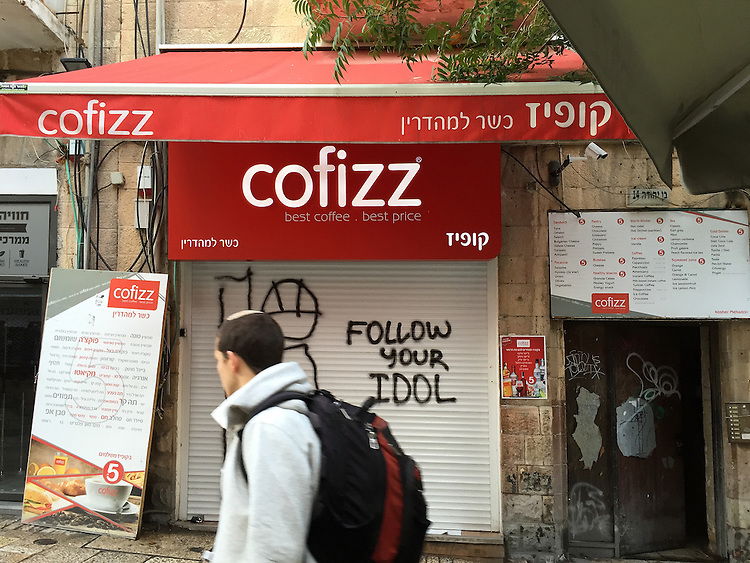 A young religious Jew walks by shuttered coffee shop and "Follow Your Idol" graffiti in a pedestrian walkway, West Jerusalem. It is the sabbath, and most businesses are closed. This young man's "keepah" (skullcap) signifies he is a practicing Jew. Cofizz is a company that prides itself on brewing a rich and reasonably priced cup of coffee. "Follow your Idol" almost sounds like a play on the Joseph Campbell "Follow your bliss" injunction, but in this context, it has more of a biblical ring to it, as in the Golden Calf. Perhaps idolatry can take many forms. I like the ring of "Cofizz." It has the edgy buzz, the constant vibration, I feel everywhere in Israel.